Okroshka with Kvas is a Russian summer soup that is served cold. Think of gazpacho, which is probably the most famous other cold soup that people recognise. It’s a great soup when your garden is full of vegetables, and the weather is hot, but might be an acquired taste. Ok, it’s a love it or hate it soup, with no western food equivalent. Okroshka is derived from the Russian word literally meaning “chop” крошить, which is why it’s chopped up in small pieces. I bought a Zyliss Onion Chopper, which works beautifully for all my fast chopping (cubing) needs. There are many ways to make Okroshka, from a soup base perspective, but the vegetables always are kind of the same. It commonly a vegetarian soup, or you can use boiled meat, but I opted for using ham. The 2 most common Okroshka soups are made either with Kvass or with Kefir, both having a totally different soup flavour. There’s also Svekolnik and Holodnik Soup, which are cold type of beet Borscht soups which is one of my favourites. I’ve made Okroshka with Kefir it’s my favourite Okroshka. This recipe is made with Kvass, which is a Slavic fermented drink, made from Rye bread, flavoured with raisins, berries or even mint. It is slightly alcoholic, usually less than 1%, which is considered alcohol free in Russia, but you would need to drink an incredible amount to feel it’s effects. It’s considered almost a version of Russian Coca-Cola style drink, only healthier. In Soviet times, there was a large Kvass barrel on wheels, which people would line up for, drinking from a single communal cup. Whilst I never experienced this, the thought of drinking from a communal cup with hundreds of strangers grosses me out. Luckily you can buy it like a soft drink now. There is even Kvass sold for summer soup. As Kvass can be hard to find, you might need to make it yourself, as you definitely don’t want a sweet Kvass for this soup. Check out my tasty Kvass recipe. The best part is that Okroshka with Kvass is incredibly filling as it’s packed full of vegetables. Bon Appetit! Приятного аппетита! Okroshka is a cold summer soup, made with garden fresh seasonal ingredients, and Russian rye bread Kvass. A totally different take on cold summer soups: A Russian Classic. Hardball the eggs and cook the potatoes until cooked, but not overcooked and soft, peel and cut into small cubes. Cool the eggs and if possible slice thinly. If the egg falls apart, then cube it and tell your family that's how it was meant to be made! Cut the ham, cucumber, radishes into the smallest cubes you can. 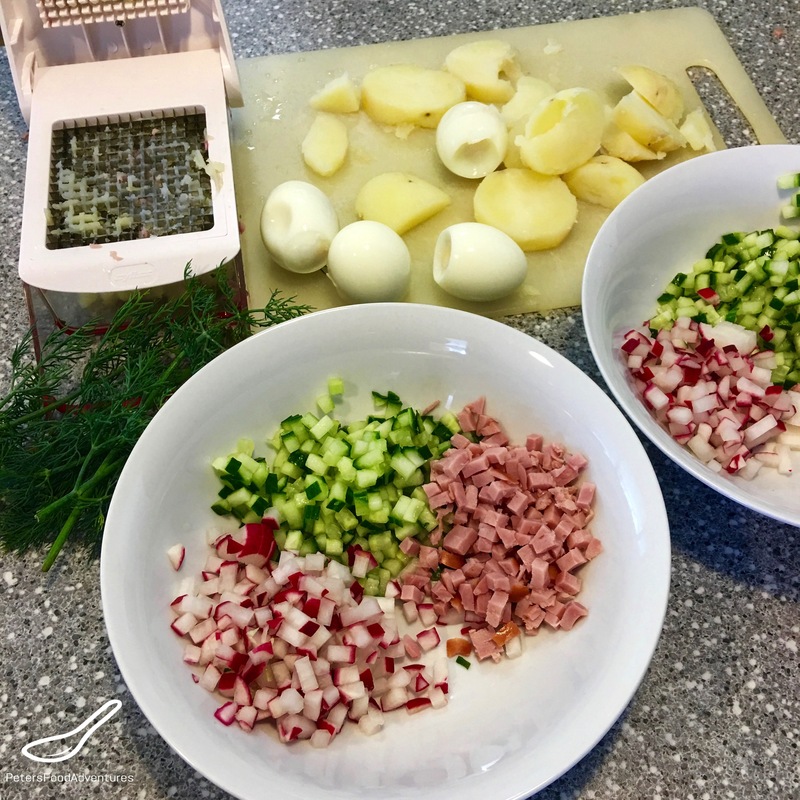 Place eggs, potatoes, ham, cucumber, radishes and salt in a large pot (or individual bowls). Add the chilled Kvass and stir together. It's best if your refrigerate for an hour to allow the soup to get really cold, before serving with the sour cream, dill and green onions. If you don't have time to chill, then you can serve with a few ice cubes. When mixing the sour cream, stir quickly so it doesn't curdle. I never personally liked Okroshka but the rest of my family loves it. Thanks! It’s definitely a love or hate thing I think!!! ???? This sounds so interesting Peter 🙂 I must say, I have never had a cold soup yet ! Cold soups are perfect for a hot summers day, really hot. It cools you and fills you at the same time 🙂 Cold Borscht or Holodnik and Okroshka with Kefir are my favourites. This one is a bit more acquired of a taste, due to the Kvas. When it’s summer and my mom brewed her own Kvass (the sour, not the sweet version! ), this dish made up for 80% of my diet. I love it! Only one tip you must have: the onions are NOT JUST GARNISH, a whole bundle would be used and not just two, they would be chopped first, laid at the bottom of the pot and sprinkled with coarse salt, then they would be crushed a bit with a kind of big wooden pestle (with a flat end, not a round one, it’s an ancient Russian kitchen tool), then a bit of the kvass added to let it absorb the flavour. Trust me, it makes it REALLY really fragrant! Wow, that’s great advice, I will have to try it that way. Homemade Kvass is the best! ???? The recipie is spot on. Your description of selling kvas on the streets from a wheel barrel brought fun nostalgic memories of my Russian childhood. Except the communial cup of cause…Hahaha there were no communial cups. It was served in restaurant style glasses that were washed after each use just like in America )))Disposable cups were not available at the time. Or could bring your own vessel and take some home.